Hey y’all! | Fit Girl. Happy Girl. This is my first blog post in Fit Girl. Happy Girl. I started this blog to document my progress while I train for my very first road race. It’s only a 5k but I am extremely excited because it’s something I’ve always wanted to do. I have never been considered a “runner,” in fact I used to absolutely hate running, but as I continued to train I am starting to love it more and more. 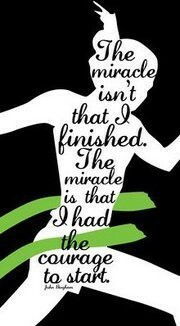 It would be my dream to one day run a marathon, and I think it could be in my blood since my Dad used to be a marathoner. Besides running I am an avid kickboxer, borderline obsessed with it actually. I am convinced it’s one of the best all-body workouts out there. The purpose of this blog is to basically share with y’all what I am doing to train, as well as some inspirational messages I find, good and healthy recipes, and hopefully pictures of some of my adventures!